Q: My neighbours and I always refer to the green space and the playground at Dovercourt Recreation Centre as “Dovercourt Park” but it’s actually called Westboro Kiwanis Park. If I happen to refer to it as Westboro Kiwanis I’ve realized that few people actually know what place I’m talking about. 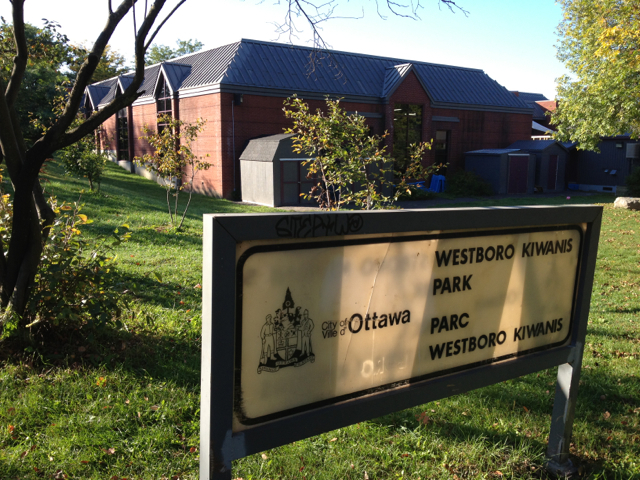 Can you shed some light on why it’s called Westboro Kiwanis Park? This story begins with the Westboro Kiwanis Club, which was founded in 1946. The Kiwanis is a non-profit service club that has a special focus on community projects for children and youth. According to City of Ottawa archivist Paul Henry, the City of Ottawa appropriated lands on Cole Avenue in 1948 in order to create a park to be known as the Cole Avenue Park. In 1951, the City accepted an offer from the Westboro Kiwanis Club to fund a wading pool in the park. The following year, the Kiwanis offered the City $2,500 to develop a playground there too. The offer was accepted and City Council dedicated the park to the Westboro Kiwanis to honour their efforts. As for the sorry state of the signage, Councillor Hobbs’ office has informed us that it is due to be replaced in 2016, but our inquiry may just be the nudge that was needed to get it done sooner.